You can take this simple step everyday of drinking a green juice and it will be well worth your time invested. The green juice benefits your body reaps are numerous! A number of your organs benefit, your liver, colon, and heart. The array of phytonutrients supplied to your body by a green juice are helpful down to the cellular level. A daily green juice can help reduce cholesterol and diabetes. 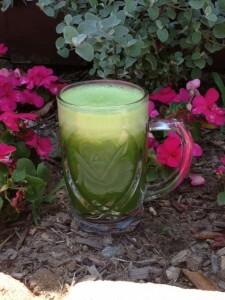 Full Body 30 Day Vegan Cleanse lists a number of great tasting vegetable juices. Let’s start with the green juice benefits to your liver. All the deep green vegetables are very helpful to your liver due to their content of vitamin A, vitamin C, beta-carotene, folate, lutein and zeaxanthin, which are very helpful to the cells of the liver. Your liver works very hard everyday helping to break down the foods you eat, the man-made chemicals and preservatives in foods, pollution that you breath in, and your liver even helps break down bio-chemicals your body produces, like hormones. You could make a big difference to your health by supporting your liver. Full Body 30 Day Vegan Cleanse promotes a healthy liver by teaching you which foods to eat and supplies you with herbs to promote liver health. Liver cleansing foods. Green juice benefits your heart too, if you are drinking juices made with a Vitamix, this is not just a juice extractor but a very powerful blender that can liquefy the entire plant. This is thee best way to get your vegetable juices because this juice will give your body all the fiber the vegetables have to offer. It is that fiber that makes a difference to your heart by keeping cholesterol low and its effect in keeping blood pressure low. Both high cholesterol and high blood pressure increase the risk of developing heart disease, drinking a green vegetable juice daily is 1 step, along with others, that can help reduce your risk of all three of those health problems. There’s even more green juice benefits to your colon, drinking a green juice daily helps to produce a healthy acid-base balance. This is crucial to cultivate an environment in your colon that healthy bacteria thrive in. An acidic environment in the colon is the environment that unhealthy bacteria thrive in. An acidic colon is an environment that a number of digestive disorders can develop in. like Irritable Bowel Disease, Irritable Bowel Syndrome, Colitis, and become life changing problems. Disease happens in an environment that is either too alkaline(base) or too acidic, the majority of Americans are too acidic. You can reset your body, learn how.